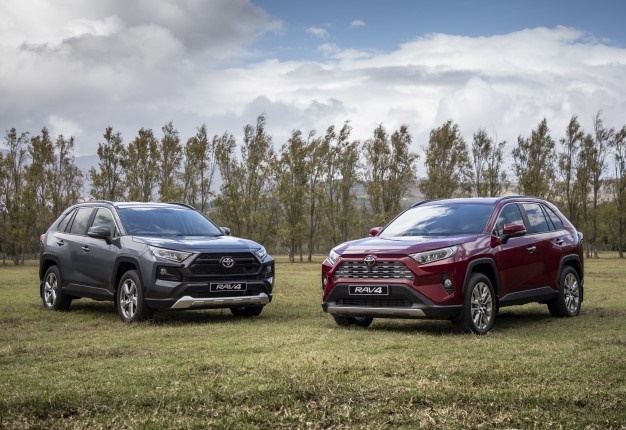 Toyota has launched its all-new seventh generation Rav4 in South Africa to take on the Volkswagen Tiguan, Nissan X-Trail and Hyundai Tucson in the competitive mid-size SUV market. The first generation went on sale in Mzansi in 1994 and Toyota admitted that the car has changed from an adventure model to be more on-road compliant in its latest guise. Toyota says there are 43 competitors in the small SUV segment and during the period from 2013 to 2018 it garnered 12% of the market with previous generation Rav4. The GX-R model (above) can be identified by its two-bar black grille. The GX-R model has a ground clearance of 195mm and rides on 19" wheels. In the flagship VX model, a beige leather option is available and contrasts well with the black instrumentation. A nifty central instrument panel houses the dual-zone climate control, USB port, seat warmer buttons and above it a 17cm touchscreen in-car entertainment (ICE) system. The VX model is the only derivative that uses an 8-speed automatic. New to the Rav4 is a rotary controller (right hand side of the gear lever) that adjusts the car for different driving conditions. A multi-function steering wheel houses buttons audio volume control, telephone, on-board computer information ,voice command, lane departure alert and the adaptive cruise control. There are two petrol engines available at launch: a 2.0-litre with 127kW and 203Nm and the top of the range 2.5-litre with 152kW and 243Nm. Toyota claim both engines emit less CO2 and use less fuel than their predecessors. Models fitted with all-wheel drive (GX-R, 2.0 VX and 2.5 VX) uses a system that allocates torque dependent on varying driving conditions. The different modes are: mud and sand or rock and dirt. The amount of torque and slip control are illustrated on the screen in front of the driver. According to Toyota, the VX models boast the highest ground clearance in their class with a lofty 200mm, thats 9mm more than the Volkswagen Tiguan. The Rav4 is priced from R416 400 for the GX MT 2WD and tops out at R577 900 for the 2.5 VX 8AT AWD model.